Weddings and personal details go together like the world's best peanut butter and jelly sandwich ever. 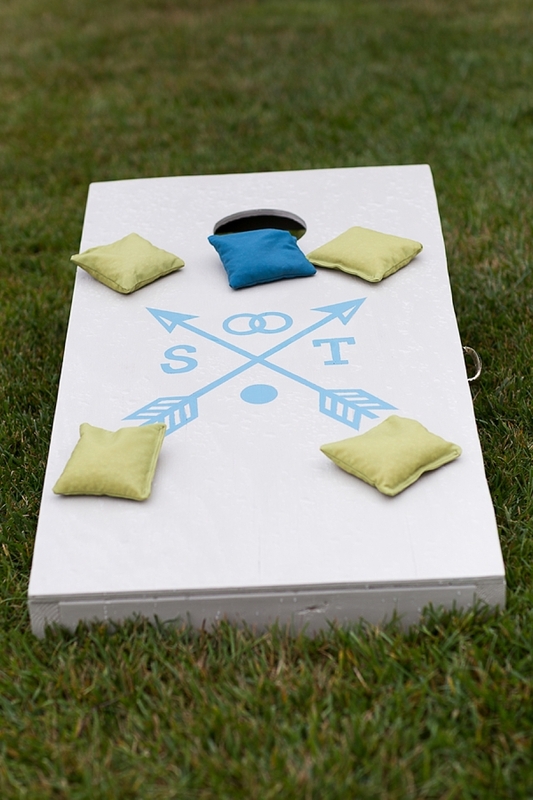 Any chance that a bride or a groom gets to share his or her personalities and interests through wedding favors, signage, lawn games, or more, it's probably going to happen because it really is one of the most important days of someone's life surrounded by the best people. That's why we were so excited when we learned about the magic that is Cricut months ago because game changer, friends! It literally has us wanting to personalize all the things. And we're not talking about only vinyl awesomeness! Did you know you could cut felt? Yup. Balsa wood? Heck yes. Or even write addresses on your wedding invite envelopes? Ohhhh, mindblowing you betcha. 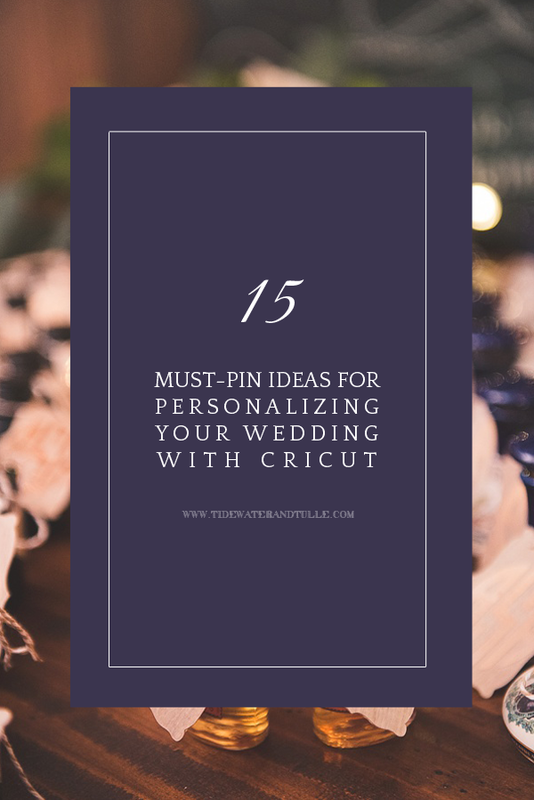 In partnership with Cricut, we have rounded up our top favorite and easiest wedding ideas for you to take your personalization to the next level by using a Cricut machine. 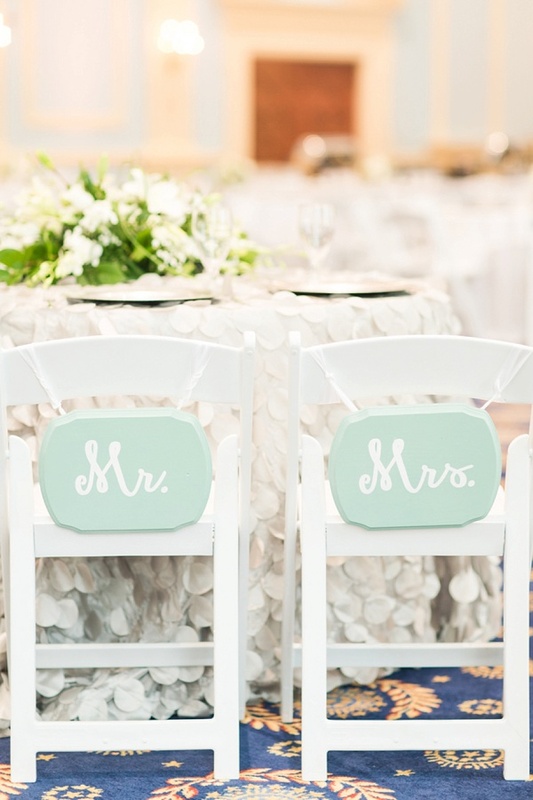 One of the biggest classic trends in the wedding world that has been around quite some time are the newlyweds chair signs. 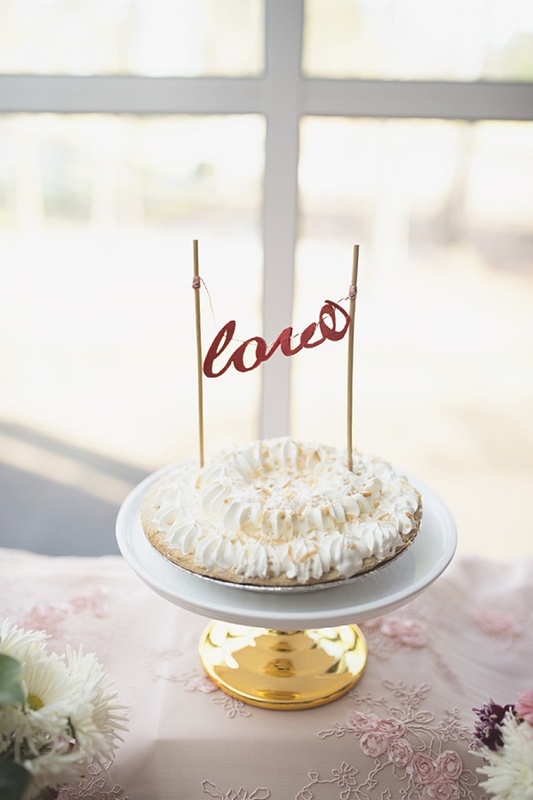 Whether it's "Bride and Bride" or "Mr. and Mrs." signage, there's something about this little detail tradition that people can't get enough of. Most couples either stick with signs made out of wood or thick paper, and those are perfect to personalize with your own wording or couple's message! Going nautical? "His Mermaid" and "Her Captain." Going fairy tale? "King" and "King." Possibilities are endless when you know which vinyl color matches your color theme! 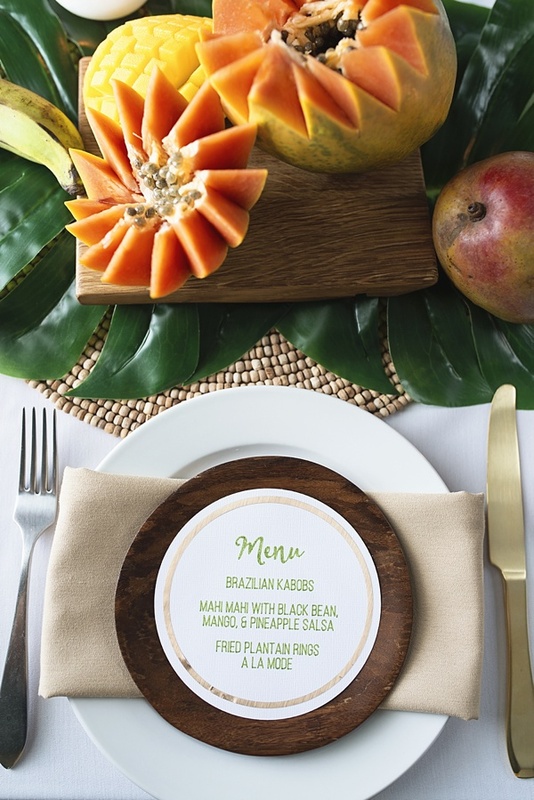 With so many ideas out there, couples no longer have to stick with poster board or traditionally framed seating charts for their guests. 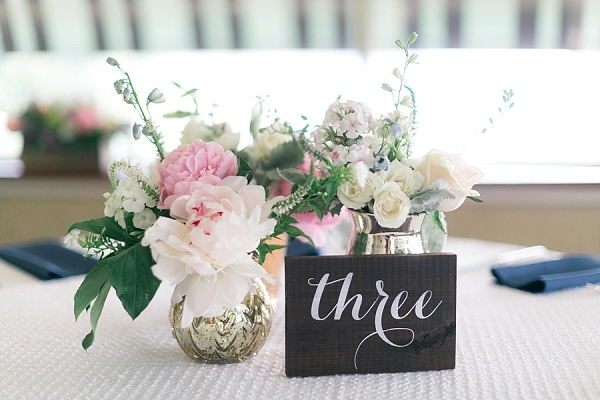 For the DIY magicians, you can play with acrylic, wood, fabric, and so many other materials to help organize and communicate to your guests on where they will be seated. 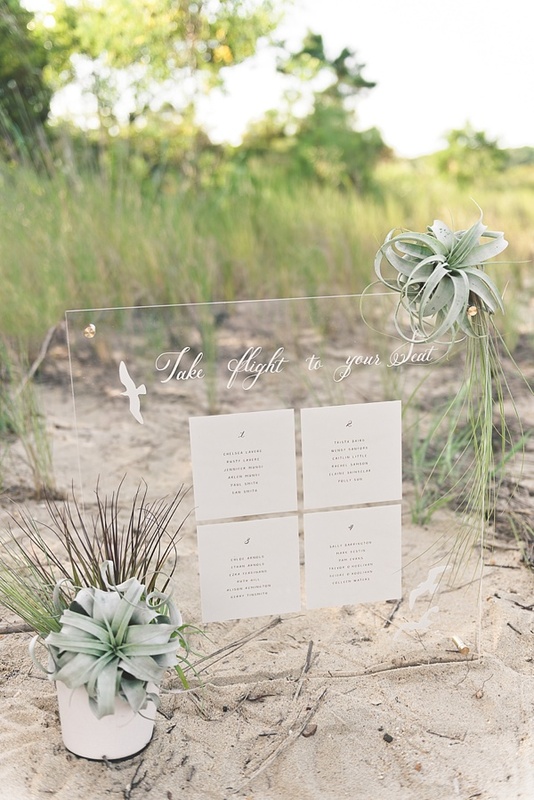 The particular example above is perfect for a beach wedding because it's heavy, shows off the oceanside scenery, paper is inside of the acrylic frame and won't be messed up by the sand or wind! So think of venue logistics before deciding on your material and explore cutting out various materials to make your seating chart happen! 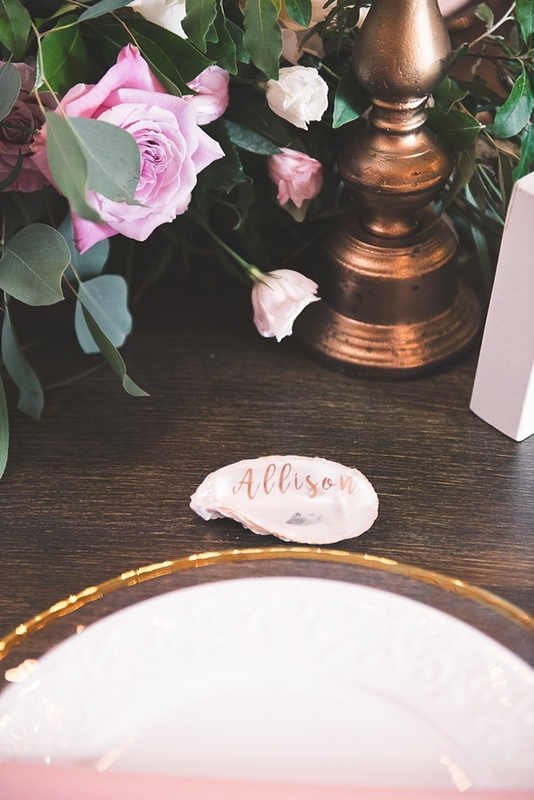 From familiar street names to cities visited together to traditional numbers, wedding table numbers help communicate to your guests where to sit (and you'd be surprised by how many do appreciate guidance with this instead of the awkward "Uhh where do I sit?" looking around!). Have a little fun with designs, names, and symbols on wood, metal, plastic, fabric, and even glass bottles. Cricut has vinyls of all colors to make creativity even more accessible. The hardest part is figuring out what you want to do! 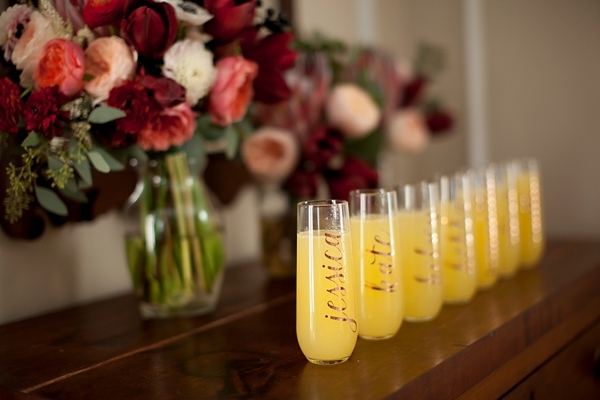 Pretty up those flatware sets for your rehearsal dinner! The easiness of iron-on/heat-transfer vinyl is a huge draw especially if you decide to use more luxurious materials like leather or more delicate fabrics like muslin. Cut out your date or design and iron! That's it. 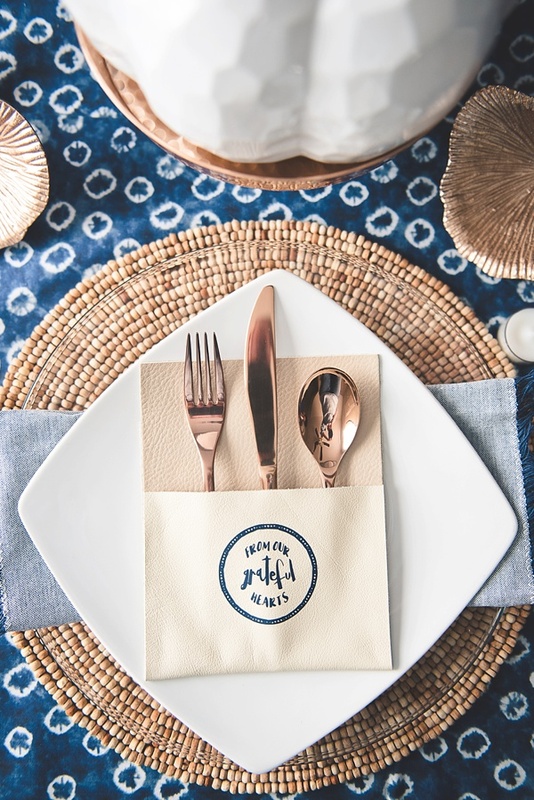 Whether you decide to use traditional materials like paper or unconventional ones like oyster shells, place cards are meant to be personalized and created just for that person you invited! This talented Cricut-loving bride decided to use adhesive foil and Mod Podge to create her oyster beauties. 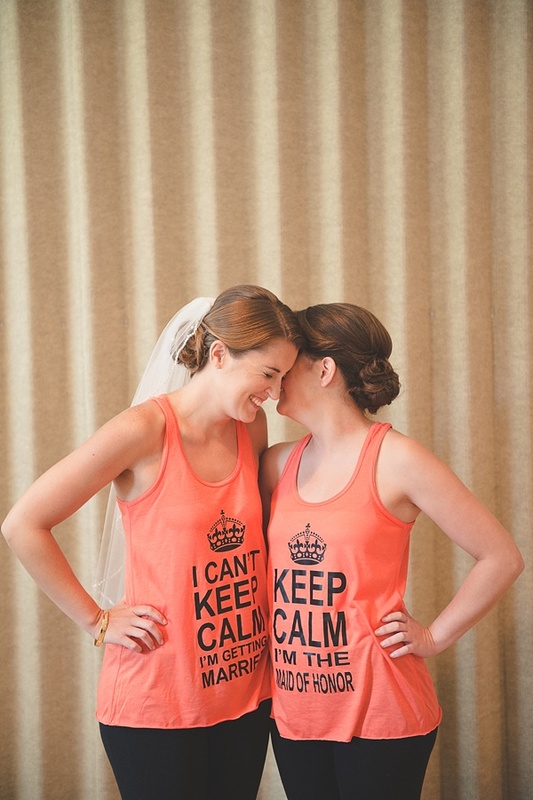 Start the wedding day off right with fun personalized t-shirts for you and your ladies! It's the little things that help set the happy vibes while getting ready on the big day, and specially designed tops are one way to do it! Whether they're cheeky or sweet, Cricut Design Space makes it easy to whip up any phrase for any kind of shirt. Fact: Gold and Glitter Iron-On material totally exist, and you will love it. 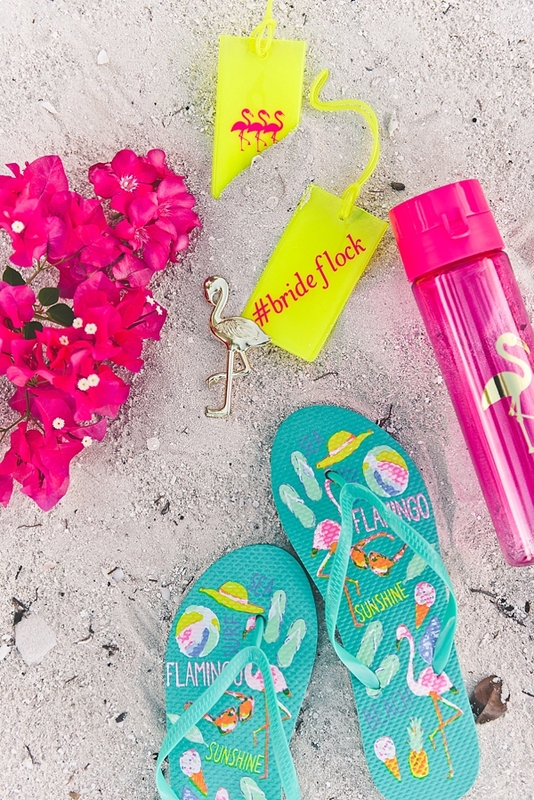 Headed to a tropical bachelorette getaway? 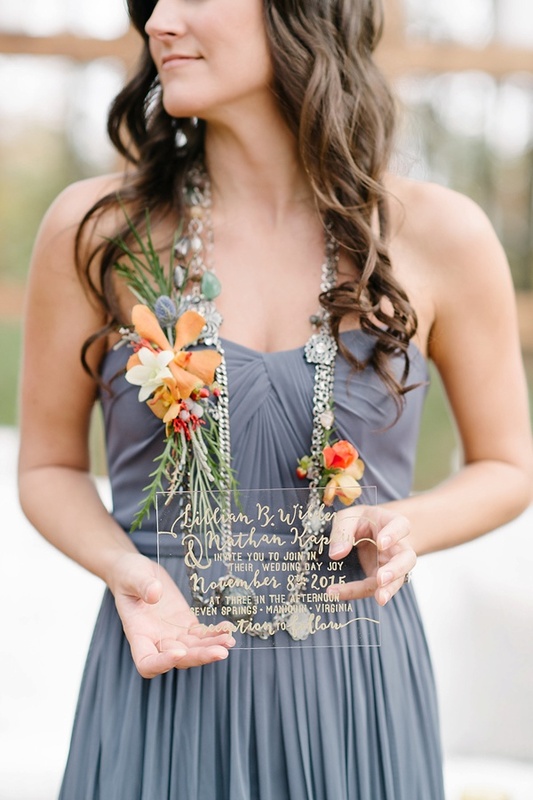 Get the celebration started with personalized luggage tags with a theme! Using Design Space clipart, our yellow flamingo-emblazoned travel tags were all created within minutes on the Cricut Design mobile app with a few scraps of leftover vinyl. It doesn't take much to transform little details! While our pretty sample photo was all written by hand, if your skill set is not calligraphy, then Cricut to the rescue! These are perfect especially if you're having a modern small and intimate wedding, send out beauties crafted out of clear acrylic and some vinyl. 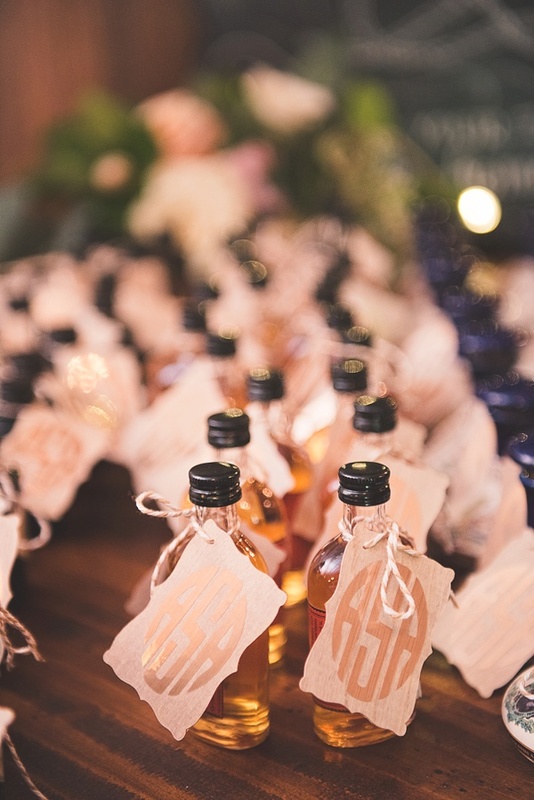 We're a wee bit obsessed with bridal shower favors since they're so easy to make when you know your theme. 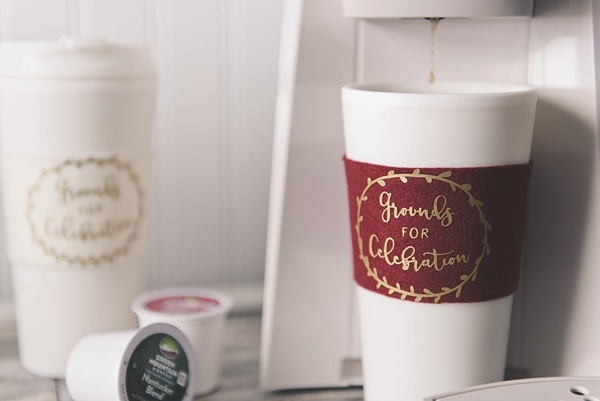 For coffee lovers or winter celebrations, our cozies with a touch of iron-on prettiness is a great "I can totally use again!" after the event. So whether they are cozies, sweet treats, or goodie bags, the range of iron-on colors are too fun to experiment with! Most of us love multi-purposed things, especially when it comes to a wedding day and you want little leftovers afterwards. 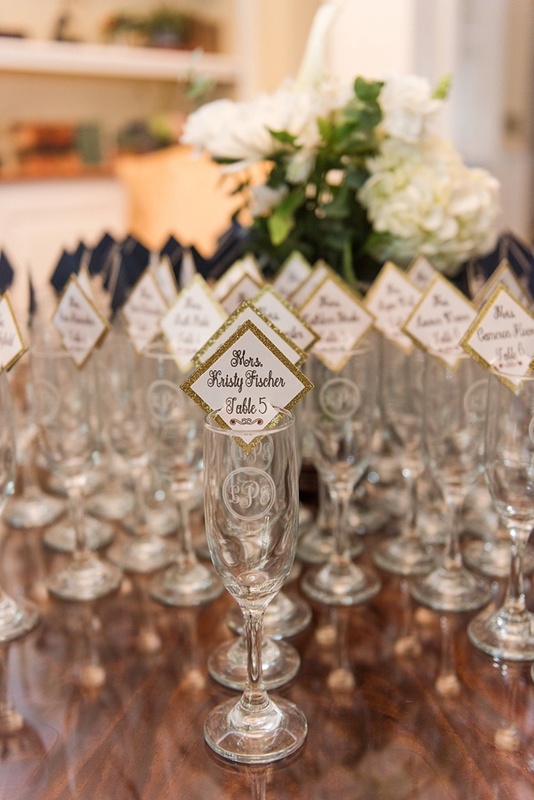 This crafty bride used her Cricut to create champagne glass tags that not only communicated where her guests to go, but to keep their glasses afterwards as their favors! 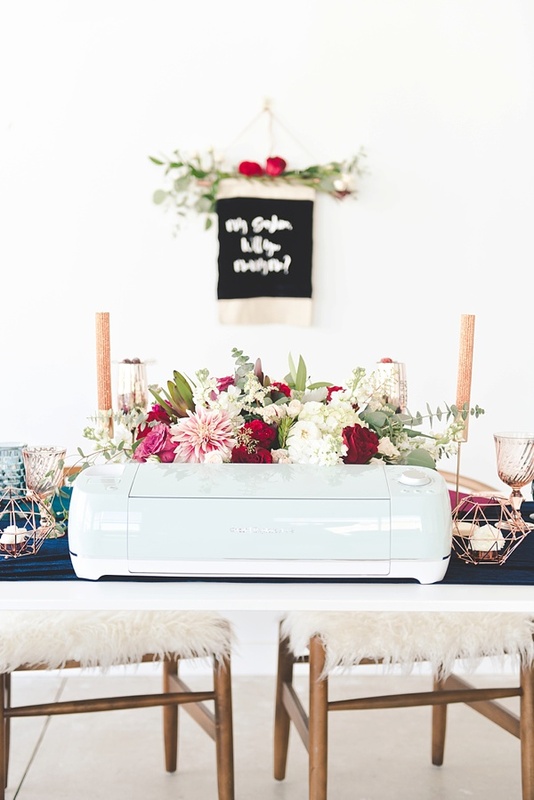 Many thanks to Cricut for sponsoring this wedding roundup and their support! And while the disclaimer is that Tidewater and Tulle was sponsored through compensation to write this, these words and our obsession love for the brand are all our own.